Dreams Palm Beach offers exceptional amenities, recreational activities and sensational cuisine. Run of House Rooms: Guest will receive any available room in the resort upon arrival, they cannot make any request, if they need a specific category they can choose from the selection at this resort. Run of House Rooms: Client will receive any available room in the resort upon arrival, they cannot make any request, if they need a specific category they can choose from the selection at this resort. 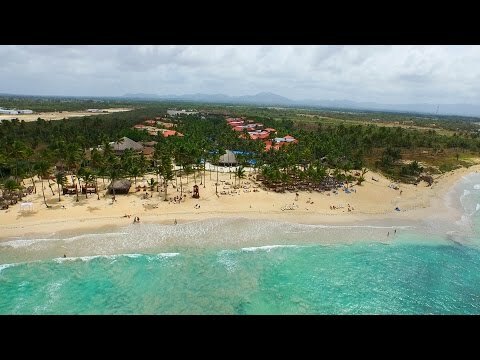 This resort is located approximately 11 miles (17 kilometers) from the Punta Cana International Airport and boasts a stunning beachfront location. Dreams Palm Beach Punta Cana provides an ideal tropical getaway in one of Punta Cana`s most breathtaking locations. The area is famous for its idyllic beaches and warm, crystal-clear waters, along with many opportunities for recreation and an exciting nightlife. Dreams Palm Beach Punta Cana boasts 500 spacious Guestrooms and ample suites located in nine three-story buildings. Your room or suite is family-sized and filled with luxury amenities for your every comfort. Dreams Palm Beach now welcomes small dogs (under 22 lbs. or 10 kg) in their accommodations and on property. This service is available for $65 USD per night, in specific room categories only. Only small dogs are permitted. Please contact reservations by emailing reservations.drepb@dreamsresorts.com To check availability guidelines, restrictions and availability apply and are subject to change at any time. Required upon check-in: Dog`s name, weight, age, color, and breed for identification purposes during their stay Vaccination certificate from veterinarian proving Bordetella and Rabies vaccinations within the past 12 months. Evidence that a current treatment for fleas and ticks is in use. No more than one dog is permitted in any guest room. Dog is allowed only on designated dog area(s) of the hotel grounds. Dogs are not allowed in the Pool, Fitness Center, Spa, Retail shops, and Golf facilities. Due to local regulations, dogs are not allowed on the beach. Dog must be on a controlled leash at all times or in a dog carrier when not in the guest room. Guests are responsible for cleaning up after the dog on resort grounds and properly disposing waste in designated areas. Dogs cannot be left alone in Guestrooms for periods longer than two hours. Guest must notify the front desk and hang the Dog Friendly Room door hanger when leaving their dog unattended in the guest room. Guest must answer the cell phone number provided to the resort while their dog is unattended in case there are any issues. Dogs must never be left alone overnight. Please contact the concierge if boarding recommendations are needed. Guestroom cleaning services will not be carried out unless the guest is present. The dog owner must be in the room if the dog is present when the Guest`s room is cleaned, in order to not frighten the pet and to avoid the risk of a pet`s escape. Please contact the concierge to schedule convenient cleaning times. The resort reserves the right to request the dog`s removal if the above guidelines are not adhered to. Restrictions, guidelines and availability are subject to change at any time. Couples with children will have a blast and make new friends at Explorer`s Club for kids. The Club Is Exclusively for Children Ages 3 to 12 with Fully Supervised Activities by Red Cross Certified Staff, and Is Open From 9:00 A.M. - 10:00 P.M. The property features a new convention center consisting of approximately 2,200 square feet (204 square meters) of an open foyer, computer stations, a ballroom with variable layouts, multiple break-out rooms and a theatre with state-of-the-art equipment, making it the perfect venue for meetings and incentive travelers. The resort offers your choice of four pools treated with chlorine including two main pools and two at the Preferred Club. This resort also features a world class spa where you can enjoy a massage, facial, or a host of invigorating treatments (fees apply). Wedding in Paradise Package: This is complimentary when booking at least seven nights in Preferred Club Honeymoon Suite with Jacuzzi room category or higher or if five rooms of any category are booked for at least three nights. This package also applies for renewal of vows ceremony. Selling price from $999 USD or complimentary. Dreams of Love Package: Selling price from $2799 USD. Dreams Ultimate Wedding: Selling price from $3299 USD. Dreams Eternity Honeymoon Package: This is complimentary when booking the Preferred Club Honeymoon Suite with Jacuzzi room category or higher for a minimum of seven nights stay. Selling price from $999 USD or complimentary. Dreams Ever After Vow Renewal Package: This is complimentary when booking the Preferred Club Honeymoon Suite with Jacuzzi room category or higher for a minimum of five nights stay. Selling price from $499 USD or complimentary. Note: Request must be made at time of booking. Couples will be required to present a copy of wedding invitation or marriage certificate at time of check-in. Package is subject to change without notice and is only applicable to couples staying within three months of the wedding or over their anniversary date only. 15% discount on spa treatments cannot be applied to spa packages or combined with any other spa promotion or offer. These packages are in USD funds. Once the wedding is confirmed it cannot be cancelled within six months of the date of the wedding without a fee. Cancellation penalty is $500 USD (subject to change without prior notice). Other restrictions and exclusions will apply. Please check with hotel wedding coordinator. 18-hole golf course just a short drive away. There is also an on-site casino and the Desires Night Club. Every sixth room within the group will be complimentary. One free room upgrade to the next available category for every ten paid rooms based upon availability. $100 USD in Resort Coupons per person for individual spending (rules of use apply). Group private check-in when all group participants arrive together to the resort on the same date at the same time. Group arrival flight information must be provided to the hotel with at least seven days anticipation. Six room minimum based on double occupancy. Maximum of 20 rooms. Group rates are combinable with all promotions. Rates apply to social groups and not to corporate meetings or incentives. Private events can be set up but would incur additional charges, and must be set up in advance with hotel`s group manager. The use of Drones or artifacts that fly or float in or on the premises of AMResorts hotels is strictly forbidden and cannot be used within the limits at this resort.